A police officer trying on the cow shoes. 1924. During the alcohol prohibition (1919-1933), the transportation and brewing/cultivation of alcohol was prohibited. Some people who brewed Moonshine (a type of whiskey) did it in the middle of a forest or meadow. Moonshiners were often sought after by law enforcement. A lot of times, authorities had to track the alleged criminals by foot. So to avoid capture, some moonshiners changed their shoes because a set of human foot prints would be suspicious and indicative of people brewing or transporting alcohol. Specifically, they put on cow shoes. Hoof prints were meant to make the cops never follow the tracks in the first place. Obviously if they came across a still, they’d do something about it. But with hoof prints, the thought is that if the police encountered said prints, they’d think nothing of it, whereas if they encountered human foot prints, they’d possibly follow them and ultimately discover a still. 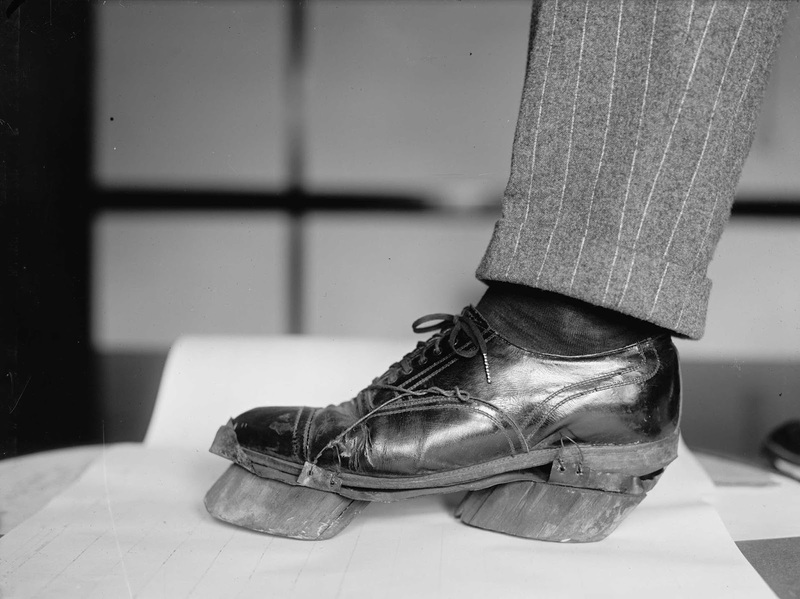 A 1922 article from a now-defunct St. Petersburg, Florida newspaper called the Evening Independent carried a story about moonshiners wearing “cow shoes” to trick revenuers – rather than leaving suspicious footprints leading up to their secret stills, they’d leave innocent-looking hoofprints in the dirt and grass. A new method of evading prohibition agents was revealed here today by A.L. Allen, state prohibition enforcement director, who displayed what he called a “cow shoe” as the latest thing front the haunts of moonshiners. 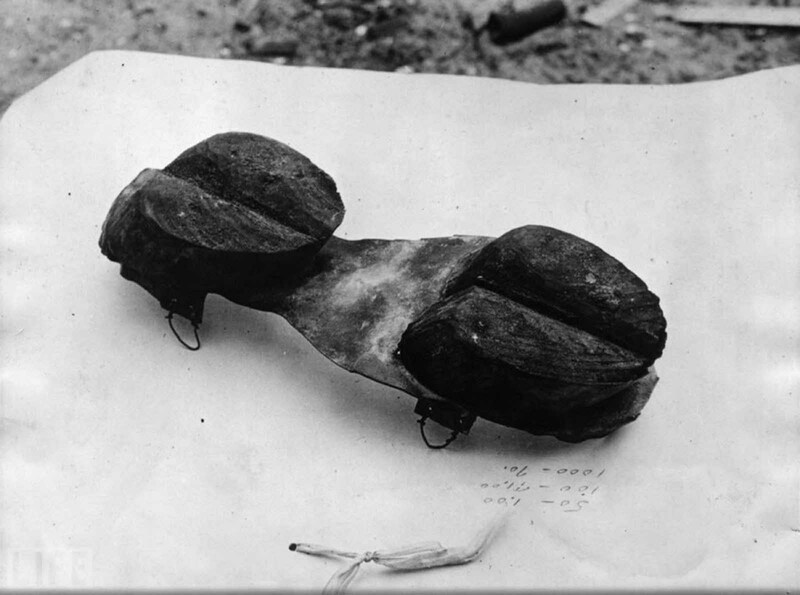 The cow shoe is a strip of metal to which is tacked a wooden block carved to resemble the hoof of a cow, which may be strapped to the human foot. A man shod with a pair of them would leave a trail resembling that of a cow. The shoe found was picked up near Port Tampa where a still was located some time ago. It will be sent to the prohibition department at Washington. Officers believe the inventor got his idea from a Sherlock Holmes story in which the villain shod his horse with shoes the imprint of which resembled those of a cow’s hoof. 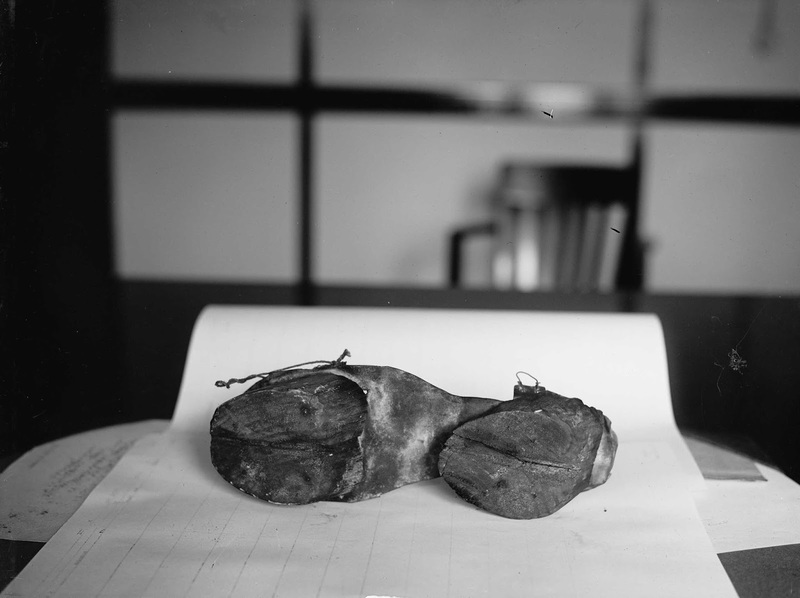 The wooden block was carved to resemble the hoof of a cow. Allegedly this idea was taken from one of Sherlock Holmes’ stories. Moonshine is a term used to describe high-proof distilled spirits, generally produced illicitly. The word “moonshine” is believed to derive from the term “moonrakers” used for early English smugglers and the clandestine (i.e., by the light of the moon) nature of the operations of illegal Appalachian distillers who produced and distributed whiskey. The distillation was done at night to not be caught distilling. Prohibition in the United States focused on the manufacture, transportation, and sale of alcoholic beverages; however, exceptions were made for medicinal and religious uses. Alcohol consumption was never illegal under federal law. Nationwide prohibition did not begin in the United States until 1920, when the Eighteenth Amendment to the U.S. Constitution went into effect, and was repealed in 1933, with the ratification of the Twenty-first Amendment. Infiltrators/smugglers in WW2 had clog shoes with the soles on backwards, to fool the Germans into tracking them the wrong way. Today “Moonshine” usually refers to homemade liquor and it’s still illegal, but for different reasons. The only reason it is illegal is because the government cannot tax it. Also, unlike beer and wine, it’s illegal to make liquor without a license. Moonshine contains more alcohol than others, it’s pure and can be lethal. It can cause blindness or other health problems way more than everyday alcohol.